ABO glycosyltransferase with UDP-galactose in red and yellow, a manganese ion in magenta, and the target sugar chain in green. Antibodies in our blood constantly search through the body, making sure that only the proper molecules are present. This is essential, because they protect us from invaders like bacteria and viruses. They can cause problems, however, in medical treatment. For instance, if blood is given in a transfusion, it needs to be similar to the normal blood, so that the antibodies are fooled into thinking that nothing is amiss. By studying these similarities, researchers have discovered that blood comes in several types, which define groups of people with compatible blood. The ABO system defines one of the major types determining groups of people who can donate blood to each other. Proteins and lipids on the surfaces of red blood cells are covered with carbohydrate chains, which form a protective coat around the cell. The ABO blood type is determined by the type of sugars that are used to build these carbohydrates. The carbohydrate is built around a core of 5-13 sugars, called the H-antigen, that ends in a fucose sugar. For people with the O blood type, the story ends there. For the A and B types, however, a specific glycosyltransferase, such as the one shown here from PDB entry 3i0g , adds one more sugar to the end. For type A, this sugar is N-acetylgalactosamine, and for type B, it is the slightly smaller sugar galactose. This small difference, however, has a critical effect. The immune system searches through its repertoire of antibodies and gets rid of any that would attack the normal molecules found in the body. So, a person with type A blood doesn't have any antibodies to bind to the type A sugars. They do, however, have antibodies that attack type B carbohydrates, which will attack any type B blood cells that are transfused. People with type O are great for donating blood, since it will not cause problems with people with type A or type B antibodies, but if they need a transfusion, their options are limited since they have both of these types of antibodies in their own blood. Carbohydrate-binding proteins from several different organisms, with sugar chains shown in green. The blood type carbohydrates provide ready handles for attachment, and are exploited by many organisms. A few examples are shown here. 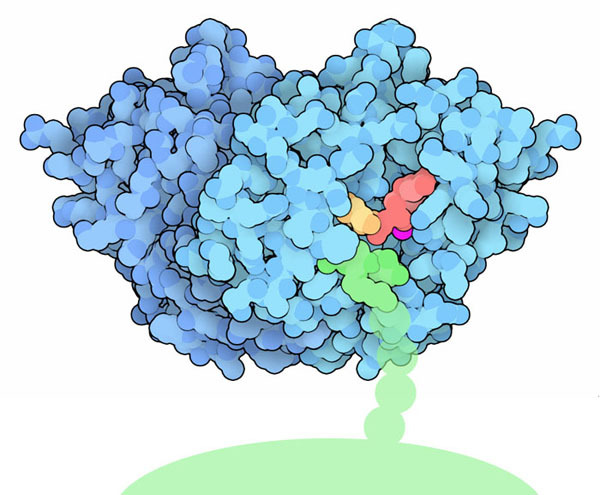 At the left is a lectin from a seed (PDB entry 1lu1 ), with four binding sites for carbohydrates (in all of these pictures, the structure includes a few sugars from the longer natural carbohydrate chain, shown here in green). The biological function of seed lectins is not fully understood, but may be part of the defense of the plant. The function of the two proteins on the right is more obvious--they are proteins from a bacterium and from a virus, which are involved with the process of infection (PDB entries 2j1u and 2obs ). The ABO blood type of each person is determined by a single gene. For the A type, there is a gene for GTA, a glycosyltransferase that adds N-acetylgalactosamine. For type B, the gene encodes GTB, a different glycosyltransferase that adds galactose. For type O, neither enzyme is made. Amazingly, GTA and GTB are almost identical, with only four amino acid changes (shown here in turquoise on PDB entry 1lzi ). This tiny difference in sequence, however, has life-or-death consequences! 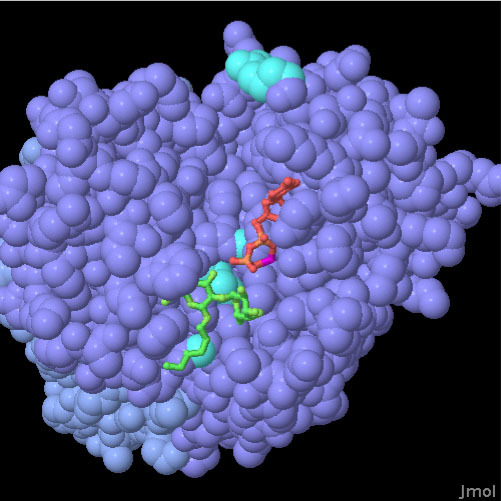 To explore the structure of these two enzymes, click on the image for an interactive Jmol. Researchers have studied the specificity of GTA and GTB by creating mutants that include some amino acids from GTA and some from GTB. Structures of many of these hybrid glycosyltransferases are included in the PDB. The PDB includes many proteins involved with other blood types--try searching for "Blood Group Antigens" to explore some of them. J. Koscielak (2001) ABH blood group active glycoconjugates from human red cells. Transfusion Medicine 11, 267-279. S. I. Patenaude, N. O. L. Seto, S. N. Borisova, A. Szpacenko, S. L. Marcus, M. M. Palcic & S. V. Evans (2002) The structural basis for specificity in human ABO(H) blood group biosynthesis. Nature Structural Biology 9, 685-690.